Huntsville, AL- Angela Rittenbach, President and CEO of Riverstone Solutions, Inc., has been a long time advocate for STEM outreach programs. Earlier this year, Angela had the opportunity to partner with other community leaders to form a non-profit organization to further that goal of STEM outreach and support. CyberReach.Org was established in March, 2018 in Huntsville, AL. 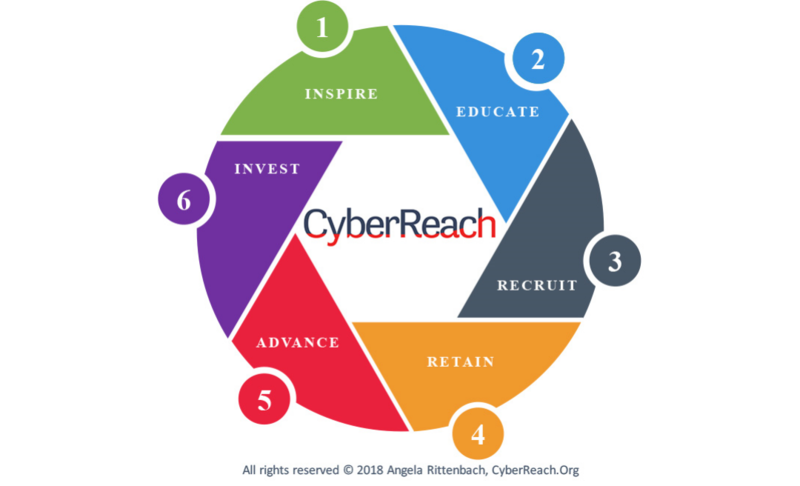 The mission of CyberReach is to Connect, Prepare and Grow a Qualified and Diverse Cyber Workforce. Angela was appointed by Governor Kay Ivey to support digital literacy and computer science textbook selection earlier this year. She also served as the Director of Workforce Development for Cyber Huntsville in 2017. As a part of this work, Angela had the opportunity to hear first hand about some of the challenges educators and students face in trying to gain access to robust cyber and computer science curriculum. Educators are often faced with the challenge of teaching material outside their training and comfort zone to students with a far more advanced digital skillset. “Educators need access to curriculum and resources to challenge and engage students. Students need the opportunity to be exposed to advanced computer science and cybersecurity courses.” commented Angela Rittenbach. “There is an abundance of untapped talent available, but we must provide the support and resources to develop the next generation of cyber specialists.” CyberReach plans to work with industry leaders, K-12 schools and other organizations to create “Cyber Clubs” to expose kids to advanced training and challenges. “With an estimated 350,000 open cybersecurity jobs in the US, we have to rethink our education and recruitment approach.” Angela noted that a fundamental part of the CyberReach strategy is to provide outreach programs to underrepresented groups, such as Women and Minorities, in STEM and Cyber fields, Women currently represent only 11% of the overall cyber workforce. CyberReach has launched a Women in Cyber initiative in Huntsville, AL that it hopes to mirror and grow in other communities. “Women working in STEM programs and careers really need to connect, network and support one another. More than 54% of women leave a STEM career so retention is key.” Angela commented – based on her personal experience. With a background in Electrical Engineering and Computer Science studies, Angela knows first hand about the challenges of being the only woman in the room in both college and professional courses. Riverstone Solutions, Inc. is proud to be a founding corporate sponsor of CyberReach.Org.